N : Doctor Takada, first, tell us about your current research. 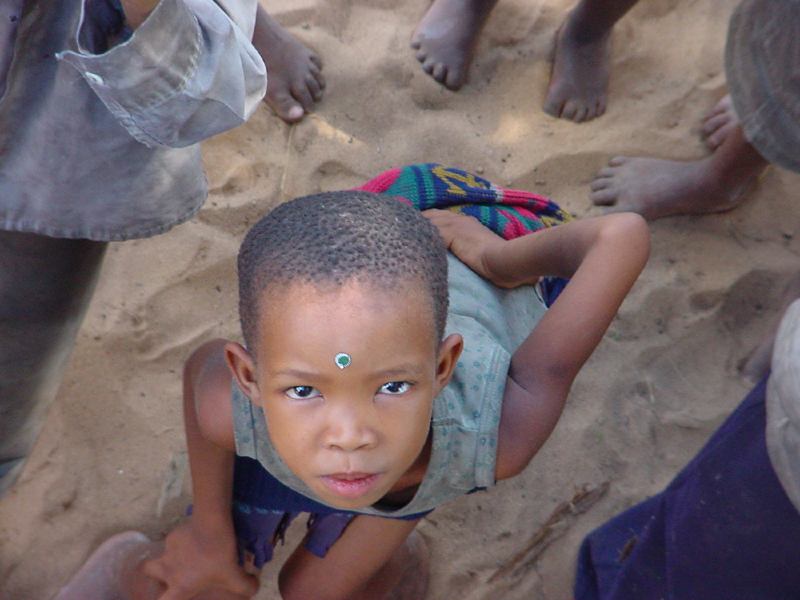 Takada : I study the San, who live in southern Africa, and the characteristics of their social interactions. 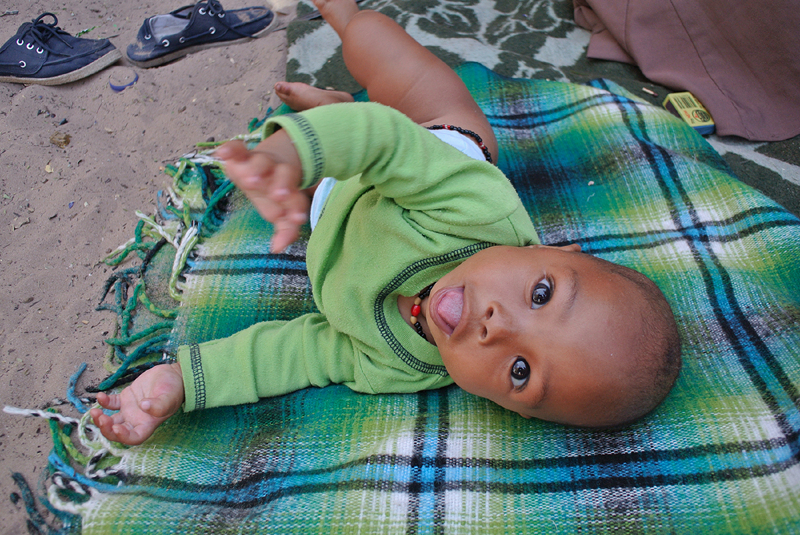 I started my research focusing on individual development from childhood into adulthood among the San. Since this was an enormous research topic, I have not yet been able to study their development as a whole, but rather, I am taking a step-by-step approach, dealing with their child-rearing practices and the ways they view their environment, for example. N : Will you explain “social interaction” for us a little more? Takada : It overlaps a lot with “communication.” Interaction inevitably involves two parties, so it means, “I do something to someone, and that someone does something to me in return.” Of course, this happens between people all the time, doesn’t it? If the interaction is between man and the environment, usually we don’t call it “social” interaction. When people do something massively to nature, nature may be affected, which in turn may affect people. For example, overgrazing by the pastoralists would deplete grazing grass, and this will greatly impact the pastoralists’ way of life. Or when hunter-gathers deplete game in a given area, they have to change their livelihood, say, and become nomadic. I like to think of social interaction quite broadly in this way, and that is why I am dealing with the topics I just mentioned. N : You do research in both Botswana and Namibia. How did you come to choose the 2 countries? Takada : My research advisor was Professor Tanaka Jiro (now Emeritus). So I went to Ghanzi District, Botswana, where he did his research. But the research permission from the Botswana government took a long time in coming, and I was without a field site of my own. In those days, little research was done in Namibia, and the advice I got was, “Why didn’t I pioneer research in Namibia?” So I was doing research in Namibia for a while. Then luckily the permit for research in Botswana was granted. Since I had a hard time getting started in the field, I got ambitious (laugh) and said, “Why pass up on the chance to do both countries?” That’s how I got started in the two countries. They are next door to each other, and in both countries, the San and the pastoralists live side by side…. N : Now tell us how you became a researcher. Takada : There was a time I was not quite sure if I would become one. Before I went to the master’s course in Faculty of Letters, and then after I got there, I was not sure at all. But I had a good mentor back then, he looked after me and seemed to enjoy it at the same time, and I thought it might be a nice way to live your life like that. Then one thing led to another…. N : Then you had not thought of becoming a researcher when you were an undergraduate student? Takada : At Faculty of Letters at Kyoto University, almost half the undergraduates went on to graduate school, and the atmosphere was you either chose to go to graduate school, or got a job. I took time in deciding as anybody would, but graduate school was one choice. N : When did you decide on Africa? Takada : Now, this interview is getting serious! It was half serendipity. For one thing, the African Center was recruiting students. As an undergraduate at Kyoto University, I had this image of a strange bunch of people studying Africa. I did not know anybody in person, but they all seemed interesting. I got accepted, and here I still am. N : What kind of graduate life did you experience? Takada : Graduate life never feels over (laugh)! All these years really went by quickly as I was going back and forth between field research and Japan. Especially because I started in 2 countries about the same time, it took me twice as much time to get situated, I think. That’s how it went. N : Why did you switch your major from psychology to African area studies? Takada : I became an African area studies major, my expertise became anthropology, but it is not too distant from psychology. Research involving fieldwork in psychology is rather minor, and I always wanted to do fieldwork. So I chose fieldwork and where people did fieldwork. 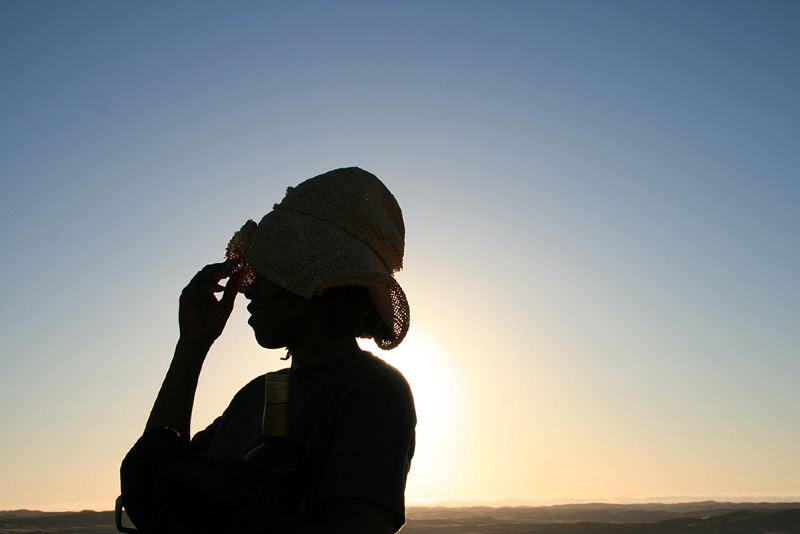 Of course I was attracted to Africa, but as a precondition, I was probably more attracted to doing fieldwork. N : Tell us now about the characteristics of the Graduate Program of African Area Studies here, and what is special about it. Takada : The greatest strength is that fieldwork is prominent, and there is the support for conducting fieldwork here. Sure, there are faculty and graduate programs at numerous universities in this world that is known for doing fieldwork, but I believe we really are able to support our students here. It is in our system, too. N : I do think we are special in Japan, but is it the situation worldwide? Takada : Everybody thinks that! (Laugh.) That’s what’s great…. But it is true. All of us here are rather empathic. Add this to the fact that our discipline is not so commonplace. And we do seem to be all quite unique, although I try not to overuse this word. N : I have never studied at another graduate school, so I wouldn’t know, but I feel that the graduate students here are quite close. Whether you are senior or a freshman. Takada : I agree. You go and stay together in Africa for some time, and this happens rather frequently. So you do get close. N : Even if you don’t go to Africa together, the senior students who know firsthand the country or area you chose to go will advise and look after you. By the way, what kind of students would you like to have each year? 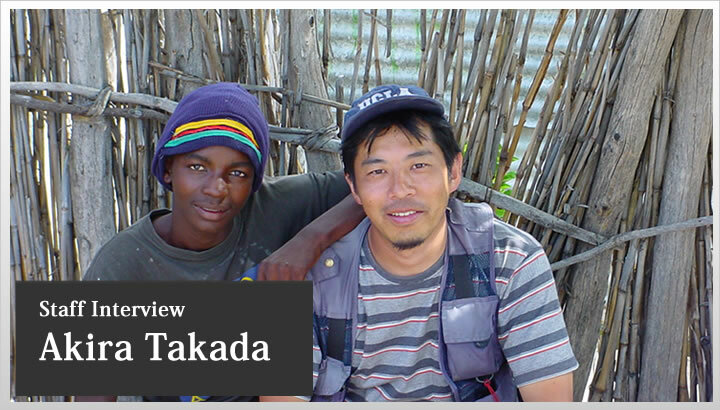 Takada : I believe fieldwork is strongly self-tailored, and can be very enjoyable for people who can find for themselves what interests them. So that type of student is expected, or rather, students who get accepted here ought to realize this. I also add that you’d be spending a long time in Africa, not just long in terms of days, but a period that could become a great turning point in your life. In no other research would you go and live among people whom you study for years. Negatively put, you can call it a workaholic kind of discipline, but because how you live your life in research is part of area studies, it is a plus if you can enjoy your research as a way of life. In other words, it is good to have that attitude toward area studies. You really can’t separate your work and private life in this discipline, don’ t you agree? N : Where do you think the future of African area studies is going? Takada : The good in area studies is that you can study anything. Each of us should go out there and study as we please. On the other hand, there are many social issues that we realize are out there when we go and observe. For example, poverty, the problem of HIV/AIDS. These call for immediate attention. We deal with the area as a whole in area studies, so we ought to respond to these issues. I think we must. N :What are area studies for you? Takada : You can ask that? (Laugh.) People may have different opinions, but I think it is all about going out there, living there, getting to know the people there, etc. Of course there are tons of literature, and you should study them. I think I ought to study more…. But, although this is important, at the end of the day, you go out there into the field. That’s the crux of area studies. N : If other disciplines embrace and start to use fieldwork as a method, where will area studies be in the world of academe? Takada : The positive spin is that’s why there is a bright future for area studies. That is to say, if the discipline is already complete and airtight, posing academic questions will take precedence to experience gained in the field. But in area studies, you are allowed to first pose questions for yourself. This is quite characteristic of area studies. N : Indeed. That was a great way to put it. Next, will you tell us about the book you found most influential to you, or your most favorite book. Takada : It is hard to boil it down to one…. I’d say, The Bushman Myth: The making of a Namibian Underclass by Robert J. Gordon (Westview Press, 1992). The author is a white Namibian, who grew up there. Bushman studies were popular as he was growing up, and he started to research on his own because he couldn’t really agree with what was being said. He redrew the Bushman image, or rather, in trying to do so, he asked, “Who are the Bushman?” So this book is interesting in many ways. Researchers contribute to a certain image of their subjects. You can even say that they even do it deliberately. This is true in a way. But this author is not Bushman, nor is he a true outsider. He grew up with some firsthand knowledge about them, and his point of view is reflected in the research. That’s why the book is a good read. I read this a long time ago, but I met the author recently, and I think I should read it again. By the way, the first book I read as a student on Africa was by Tanaka Jiro, The Hunters of the Desert (Chuko Shinsho, 1978). N : Is there something you always take to heart when you do research? Takada : Um…. Do you? Takada : Oh, we all think that. Until the day we die. (Laugh.) Well, it is so easy to start feeling desperate. So the more enjoyment we can find in research, the better. Takada : There are times I feel that way. (Laugh.) I try not to go there, though. It may not seem right to be having fun all the time, so it’s best if we find fun even when the research seems exasperating. Wow, that was well put, and this is a good way to wrap up this interview. N : Please, not quite yet. Who do you admire as a researcher? Takada : Many, many people. Professor Kinoshita Tomio (professor emeritus at Kyoto University), who put me on the path to a researcher, for one. He always seemed to be enjoying whatever he was doing. Even teaching, or faculty meetings. They can’t be fun, but he seemed to enjoy it all. Oh, he is a great fan of the baseball team, Hanshin Tigers. He always carried the sports tabloids, to conventions, even to faculty meetings. He was even appointed as a commentator on the supplementary channel when a game was on TV. N : To me, all faculty members here seem to be having fun. (Laugh.) Well, what do you do on days off? Takada : I am too busy recently, so I am working on days off. What would I do if I can take time off? I go to public baths! I love hot springs, too. My mother’s family runs an inn at a hot spring. My hobby is drawing. More often people, animals, insects, all kind of creatures, than landscape. 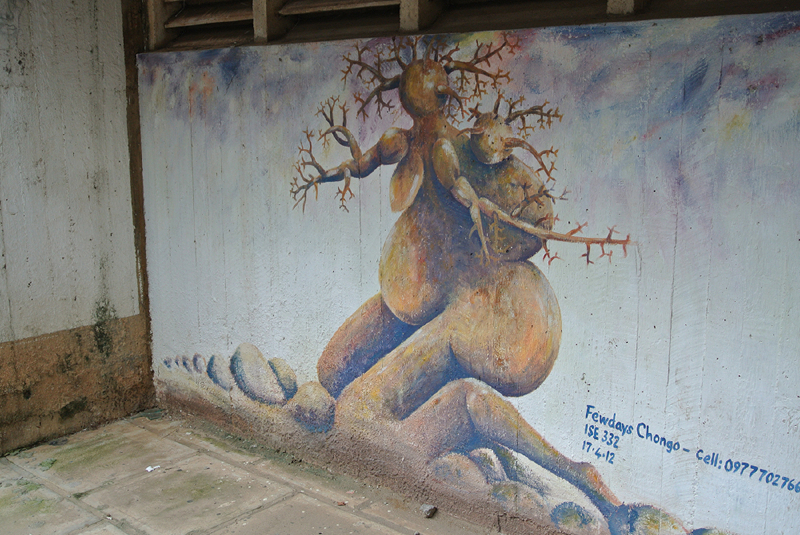 In Africa, if I am at an impasse in fieldwork, I draw a lot. (Laugh.) I would like to learn to do Japanese painting. The colors use all sorts of pigment material, and not just the colors, but the texture comes out interestingly with the different angles of light. It seems fun. N : Really. The skill is useful in the field, I feel envious of people who can draw. Takada : It is useful. It is communication. Children always like it when I draw them. N : This is the last question. Will you tell us a little about your future work? Takada : I am still sorting out the fieldwork I did in graduate school. Really. I am lucky I am able to continue in mostly the same environment. My topics are still largely my wish lists, so I intend to work seriously on them, too. N : Thank you for a frank interview, this has been most insightful. Thank you very much.